JT Ranch Dry Goods was located on Highway 6, 11.3 miles northwest of Cisco, Texas and 21 miles southeast of Albany, Texas on the Choate Ranch, owned and operated by the Choate Family. The Ranch was established in 1948 and has been in continuous operation for 60 years. While primarily a cattle operation, there is some farming of small grains for grazing in the winter and haying in the summer.The Ranch is situated in the cross timbers area of Texas and primarily Liveoak and limestone country and native grass. One unique aspect of the limestone rocks located on the Ranch is the fact that they nearly all have imbedded fossils in them. Many of the local university geology classes come to this area and look for various fossils (poprocks to the locals). The Ranch also supports abundant wildlife including whitetail deer, wild hogs, dove, bobwhite quail, ducks, wild turkey, and numrous varmits ( coyotes, fox, bobcats, and occasional mountain lion, plus others). Although hunting on the ranch is limited to family and friends, the area is very popular to people from the Dallas/FtWorth metroplex. The Choate Ranch also raises, trains and sells registered Quarter horses, primarily ranch horses and roping horses, the ranch maintains a small band of broodmares with emphsis on the Royal King bloodline. There are also two stallions on the ranch that are used within the ranch . The older stallion is a grandson of Peponita out of a Wisecamp mare. The younger stallion is a son of Playgun out of a Doc Tari mare and is currently being shown in Ranch Cutting and used on the ranch to gather cattle, sorting, draggin calves and other ranch activities. The cattle operation on the ranch is primarily a cow/calf operation and has been since the ranch was established. As conditions dictate, the ranch has also run stocker cattle and even run a small feedlot at one time. The family has added registered Angus cattle and raises some Angus showcalves for sale. JT Ranch Dry Goods is the fullfilment of a dream. JT Ranch Dry Goods Quilt Shop specializes in custom quilting, embroidery shirts, caps, jackets, bags or anything else. The embroidery machines are fully computerized and can recreate nearly any logo or design. The quilting is done on a longarm Gammill machine and it too can be standard or fully customized. The various family members all have special skills or interest, and as time allows they can create metal art, handmade spurs, all sorts of items made of wood and make anything with a needle and thread. 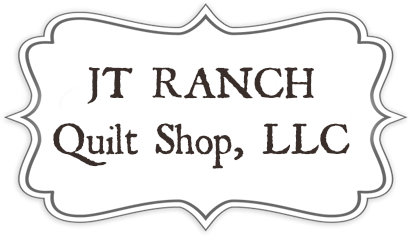 JT Ranch Dry Goods name changed to JT Ranch Quilt Shop, LLC in 2016 when we relocated to 706 Conrad Hilton, Cisco Texas. This move allowed us to bring in more fabric, a Florist, long arm quilting and domestic machines, embroidery and a gift shop.